It’s no secret. Web developers are in demand and are thriving. As demand has grown rapidly on a global scale, so have the opportunities. Job security, higher salaries, and multiple offers are now the norm for good web developers. Based on a study by US Bureau of Labor Statistics, “Employment of web developers is projected to grow 15 percent from 2016 to 2026, much faster than the average for all occupations. Demand will be driven by the growing popularity of mobile devices and e-commerce”. We can expect more jobs to be created for software developers in the immediate future because of fast-paced technological advances. But, do we have enough skilled developers for such massive job demands? If you check the map of Silicon Valley, there are thousands of coding schools and bootcamps. Each one of them markets specialized programs and courses with up-to-date approaches, methodologies, and technologies. 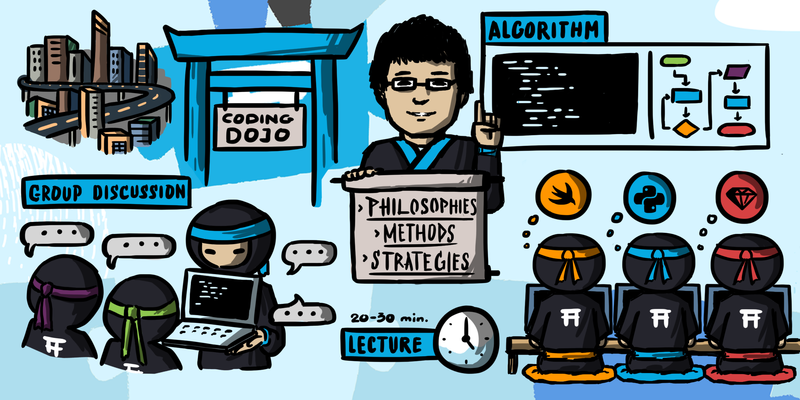 So, what makes Coding Dojo stand out? We believe that it’s our teaching philosophy on what makes an effective and continually evolving curriculum. Because on principle, we strive to improve our curriculum continuously, we have the benefit of the collective wisdom and experience from all of the instructors who have taught various methods inside the classroom over the years. We’ve been at this since 2012, and we’ve been optimizing since the beginning. 1. We continuously strive to find a better way to teach, discover better ways to explain the lessons, and we update the curriculum so that all future students will benefit. We believe that all complex subjects can be taught very simply and we encourage our instructors to optimize their teaching, always striving to teach difficult concepts in ways that are easily understood. If students do not understand what we teach, it’s because we haven’t learned how to teach effectively. It’s our responsibility to find a better way to integrate into our lessons the concepts of the curriculum, and we do this on a regular basis. At Coding Dojo, every instructor is challenged with the goal to discover a better way to accelerate students’ learning and to give them as much knowledge as possible before they graduate. Once an instructor discovers a better way to teach a difficult concept, he/she is expected to update the platform with concise lessons, so that all future students and instructors can benefit. 2. All lessons in the curriculum should be no longer than 20-30 minutes. Long videos put people to sleep. We make it a habit to teach the content of each lesson in less than 20-30 minutes because learning by doing is more effective than learning passively. At Coding Dojo, the morning lesson is to make sure that the concepts taught in the curriculum are understood. We expect our students to go through our curriculum materials before the lesson starts. Also, instructors should make an organized list of target lessons in the morning. This way, instructors can identify areas of improvement and track significant progress in students’ learnings. Compared to a traditional classroom where an instructor teaches a concept from beginning to end, we rely on the curriculum to explain the concepts concisely, and we rely on the instructors to lead group activities, and discussions to help the students quickly internalize the lesson. 3. Students need to verbalize what they have learned. We believe that reading and watching videos is not enough to retain knowledge. The best way to store learnings in our brain and to completely understand the materials is to verbalize what we have learned. That’s the reason why in Coding Dojo, we encourage our students to collaborate and help each other when they’re stuck with a problem. Moreover, Coding Dojo instructors create group sessions to challenge students to find the answers on their own, together. Although some students do want the instructors to show them the answers, we encourage and guide them to learn how to troubleshoot and fix problems on their own. In an effective classroom setting, 90-95% of questions are discussed and solved by the cohort members. Even though sometimes one on one help is needed, we encourage instructors to create opportunities for students to verbalize what they have learned and help each other. Many employers in the US are looking for web developers and software engineers, and not all of them are large tech companies. Over the last few years, many developers were snatched up by giant companies, which has left startups and small tech companies with a developer shortage. I have this vision to eliminate the skill gaps in the web industry. For that to happen, we will continue to encourage more and more people to learn to code and break through the limitations that hold them back. I believe that the future of our modern economy depends on it. It’s why our approach and teaching philosophy at Coding Dojo is not just helping people how to code but guiding our students to be an asset in the web development industry. I firmly believe that anyone can learn to code. We give our students not just the fundamental knowledge of software development, but a curriculum that has been tested, refined, modified and optimized for the last 10 years by talented software developers, seasoned instructors, and tech executives. We are committed to helping students with, diverse educational, work, cultural and individual backgrounds. We teach Coding Dojo students to apply their acquired knowledge and new skills toward their future careers as web developers. 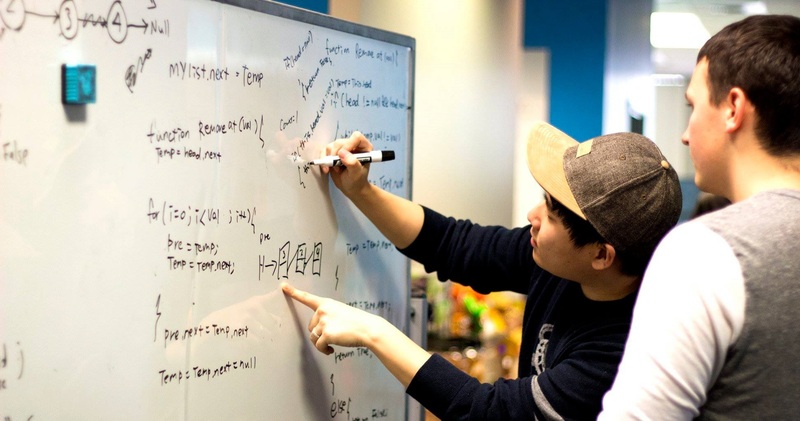 Michael Choi, CEO of Coding Dojo and CEO and Founder of Village88, Inc.